Our Draper Double Court Elite Volleyball Systems combine optimum play-ability without the budget busting price! For over 100 years schools and recreation centers have trusted Draper for the best equipment! 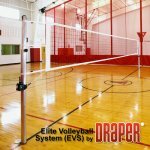 Elite Volleyball System (EVS) Drapers top of the line system available in single and double Court models.